Splyce fell in the final game of week nine. 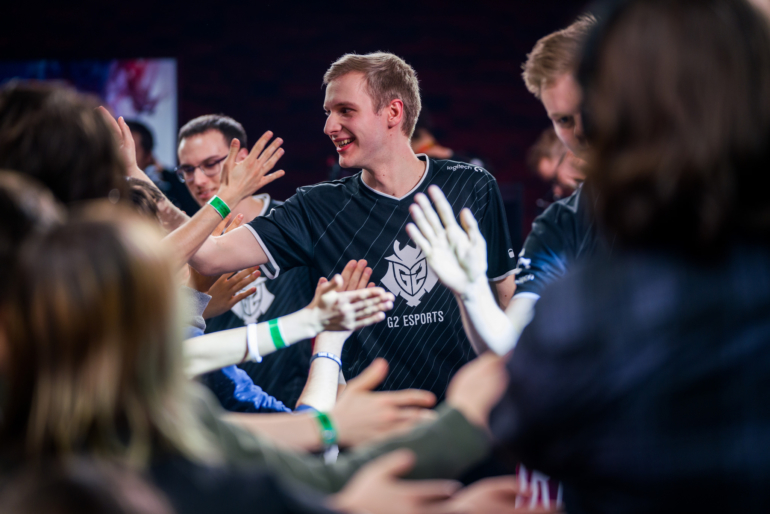 G2 Esports destroyed Splyce earlier today in the 2018 EU LCS Spring Split second-place tiebreaker. G2 beat Vitality earlier on Saturday to set up the game against Splyce, who defeated Giants Gaming in the first match of the day. Both teams knew that a win here would give them a bye in the EU LCS playoffs to increase their chance of making it to MSI as an EU LCS representative. This bye is also important in the long run—the higher a team places now, the more Championship Points they’ll get, which could be vital in securing a spot in the 2018 World Championship at the end of the year. Most of Splyce’s early game advantages came down to jungler Andrei “Xerxe” Dragomir’s perfect tactical ganks as Zac. Xerxe didn’t miss his dives into G2’s lanes, which helped the team secure important wins to build an early lead. Even with Xerxe’s early heroics, Splyce began to fall apart around the 15-minute mark. G2 found a big teamfight in the top lane when Splyce mid laner Yasin “Nisqy” Dinçer was caught out by himself. Splyce attempted to save their mid laner with a proactive play, but they ended up giving G2 more kills and a commanding lead. This play acted as a catalyst for G2’s victory. Five minutes later, a confident G2 rushed to Baron to force a play. Not only did G2 secure the Baron quickly, but they also picked off a few Splyce players to increase their lead. G2 were comfortable from this point on and continued to put pressure on Splyce with a series of teamfights and Baron-empowered minion pushes. It wasn’t long until G2 were knocking on Splyce’s Nexus with their base left in ruins. The 2018 EU LCS Spring Split regular season has now come to an end. Fnatic, G2 Esports, Splyce, Team Vitality, H2K, and ROCCAT will advance into the playoffs, where they’ll face off against each other for a shot at the Spring Split crown.